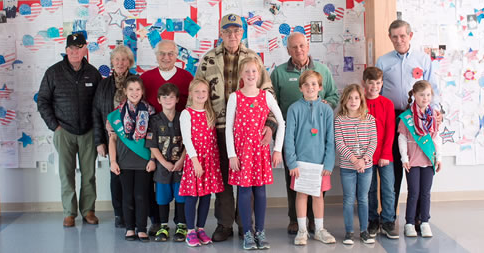 In honor of Veterans Day, the Darien Public Schools hosted a variety of assemblies and gatherings for students last week. The following is a snapshot of efforts to honor those who answered the call of duty. At Holmes School, Charlotte Palen and Addie Althoff share poems they wrote about Veterans Day. Over 30 veterans attended the 12th Hindley Veterans Day Share. 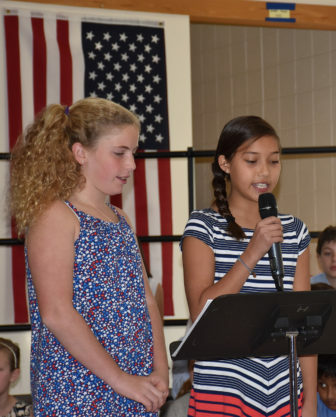 Fourth and fifth grade students kept the school in a patriotic mood with songs like, “The Star Spangled Banner” and “God Bless America.” The question and answer portion of the assembly was informative. 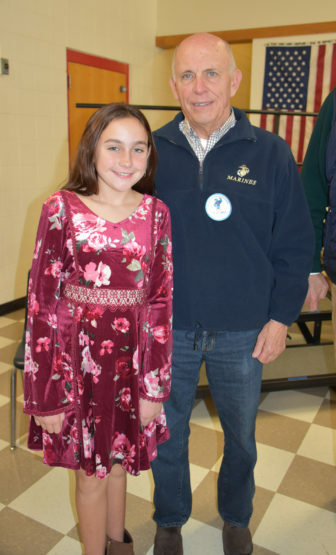 At Holmes School, Savanna Moore poses with her grandfather, Thomas Moore (a Marine), after the flag ceremony. The school welcomed 20 veterans who were honored for their service and sacrifice. The fifth grade presented a patriotic show that included songs and personalized student readings about veterans. There was also a flag ceremony. The PTO collaborated with teachers and families to organize the day to both honor military members and serve as a unique, inter-generational learning experience for students. “This year, we were pleased to welcome a range of Veterans who served from World War II all the way through the ‘War on Terror,’” said Principal Luke Forshaw. “Our diverse body of veterans had time to speak directly to student questions, hear our chorus perform patriotic songs and connect with one another during our reception. 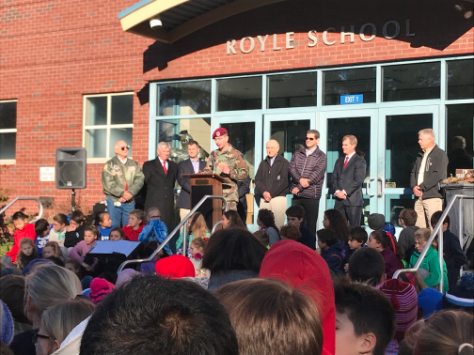 The school shared the day with 10 veterans in a special ceremony, which included the Pledge of Allegiance and performances by the Royle Minstrels. Veterans and students at Royle School. Among the invitees were: Master Sergeant Brian Hynes, U.S. Army; Ted Huffman, who served as a lieutenant in the U.S. Navy as a surface Warfare officer; Michael Aldrich, U.S. Army; and Charles Rose, U.S. Navy. Also: Sgt. Lloyd Corbett, Army; Captain Wil Ward, Army; Brian Callahan, U.S. Marine Corps; Robert Rentz, U.S. Air Force; Sgt. Squeo, Air Force and Royle fifth grade teacher; and Staff Sgt. Clinton Tarzia, U.S. Army. The school hosted two assemblies that focused on the history of Veterans Day. Students in classrooms celebrated by writing thank you notes and creating a Wall of Heroes. The front of the building was filled with American flags created by students to honor veterans. Veterans and students at the Tokeneke School Veterans Day observance. Sixth grade students created posters of veterans that told about the person’s life and what they learned from their service. Seventh grade Social Studies classes watched Taking Chance, a 2009 movie about a soldier accompanying the remains of an Iraq War Veteran. Eighth grade students attended an assembly, which featured the Camerata Singers, a student color guard, and student readings on why they were proud to be an American. Two veterans then shared their service experience. Capt. Clay Canning served six years in the Army infantry. He served in Georgia, Alaska, South Korea, and Afghanistan. Captain Sueann Schorr served for five years in the U.S. Navy and is still active in the reserves. Her time in the Navy has taken her all of the world, according to Keith Keeler, director of 6-12 Social Studies. Veterans shadowed students in classrooms and also presented in the auditorium. A few even Skyped in to share their insights and service during the day. Among the guests were: Dr. Richard McFarland, retired veterinarian and Connecticut regional coordinator for “Guardian Angels,” which provides medical service dogs for veterans with PTSD (post-traumatic stress disorder); and Kyle Gillespie DHS Parent and U.S. Navy veteran. Also: Cameron J. Davis, U.S. Air Force medic who is stationed at Langley Air Force Base in Virginia; Chris Collins, a 1993 DHS graduate, who is a transitioning Marine F/A-18 Pilot left wing and Slot pilot for the Blue Angels; Kevin Nicholas, DHS grandparent and Vietnam veteran, who presented with with Peggy Minnis, whose brother also served in Vietnam. — Marc Marin is district director of instructional technology. This article is republished from the Darien Public Schools News of the Week newsletter. As noted, some pictures were provided by the Holmes and Royle school publicity committees, along with their captions. Tokeneke Principal Mary Michelson can now easily spot the school’s mascot from anywhere inside the school’s Common Room. Nestled among the painted trees, the Tokeneke “Eagle” is a prominent feature of a new mural painted by Darien High School students and commissioned by the fifth-grade class. The new kindergarten class of “2031” began their 13-year journey with the Darien Public Schools on Thursday, Aug. 30.